It does, but it also establishes AVG’s right to sell some data collected about users of its products. Some people object, of course. “It is utterly unethical to [the] highest degree and a complete and total abuse of the trust we give our security software,” Alexander Hanff, security guru and chief executive of Think Privacy, told Wired UK. He urges AVG users to uninstall the product(s) and use another security suite. Q: Why do you collect my data? A: It’s simple. We provide products and services to help you secure your data, devices, and personal privacy. We use data to improve those products and services; provide support; send notifications, offers, and promotions; and to make money from our free offerings so that we can continue to offer them for free. AVG broadly classifies the data it collects into “personal” and “non-personal” categories. Data that can personally identify you includes such things as your name, address, email address, phone number, credit card details, AVG account username and password, and more. Personal data that AVG collects is never sold or rented, the policy states. 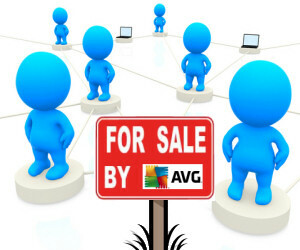 What Exactly Does AVG Sell? Should you stop using AVG, and switch to Avast, Avira, Bitdefender or some other free antivirus? Maybe, but not for the reasons mentioned here. Go ahead and switch, if you know for sure that the product to which you'll switch isn't doing exactly the same thing. A better reason to switch is how well that product does its job of protecting you from malware threats. See my article on the Best AntiVirus Software http://askbobrankin.com/best_antivirus_software_for_2015.html for more on that. In other words, when you install and register AVG Antivirus Free, you become a “lead” that may be passed to “selected resellers and distributors.” Since AVG swears it doesn’t “sell or rent” personal data, I surmise that AVG only earns commissions on leads that produce sales for its partners. In my opinion, users of AVG Antivirus Free are unlikely to be bothered much by these AVG partners. At most, I’d expect an occasional message that goes straight into my junk email folder, unseen by me. How Should You React to This News? This is nothing to get excited about, in my opinion. I don’t care at all if I am counted as one of eleventy-six AVG Antivirus Free users who are over age 40 and dwell in area code 914. Nor do I care if the statistical factoid, “Nine out of every 10 Google Chrome users also uses Microsoft Word” includes me; why should I? If selling demographic analyses helps keep software free, then sell them. What does bother me is that all of this data, personal and non-personal, is being collected by one company, creating a huge attraction for hackers. Even more disturbing is the fact that security software such as AVG’s necessarily enjoys the highest privileges on the devices on which it runs; virtually no corner of any of my devices is off-limits to security software, which has to guard every possible point of vulnerability. To be fair, I've never heard of an Internet security company being breached and plundered by hackers in the manner of Ashley Madison, or others in the news of late. Let's hope the locks on their doors are very secure. AVG is in the hot seat right now because it has made its data collection practices less opaque than other vendors have. Think Privacy’s Mr. Hanff may tell us, “use something else.” But I wonder what other free programs have buried beneath mounds of legal jargon (or just not bothered to disclose). I suspect pretty much all of them are doing the same type of data collection. “If you’re not the buyer, then you’re the product,” as the Internet saying goes. But furthermore, if you buy a product, then you become a product (a lead for someone selling related products). AVG has simply told the truth about that. Most recent comments on "Is AVG Selling YOU?" It took almost 3 weeks to (I Hope) get AVG off my computers 6 months ago. I got suspicious when AVG pop-ups kept telling me that such-and-such a program was now loading 33% faster. I concluded that my computer's registry was being "tinkered" by AVG. Boy! Was I right! There wasn't a part or parcel of the hard-drive NOT being affected by AVG Free. As I said, it was so bad that it took 3 weeks of clean-up effort to quit having some sort of obvious AVG interference with my computer's operation. What's worse, I'm sure that only a new computer will insure AVG is really gone. Do not load anything having to do with AVG on any electronic device you care about! Kaspersky, a software security company, was recently hacked. AVG swears it doesn’t “sell or rent” personal data, then shares your email address. So now some hacker would know (a) your email address and (b) that AVG is the security software at that email address. That gives them a starting point on targeting you. Perhaps it is worth a few extra dollars a year to pay for good security software, so that company doesn't have to sell your soul to raise money for their "free" software. One other question: AVG says it is sharing your info to keep their software free. Does this mean that it does not apply to their paid version? I only use free versions of virus control,so if the company can make money from my information,then I think that's only fair.So long as no privileged information is being shared.By privileged information I mean the sort of stuff hackers are after. I really like that saying “If you’re not the buyer, then you’re the product” but there is a middle ground that is almost like the under-ground, or flying low under the radar. I am fully okay with AVG bartering our data. I totally agree with us having a GoogleID. I even accept targeted advertisement to the masses' devices! I don't mind if none of us mind spam. But I opted out of such shenanigans from day one! *I have 2 totally separate identities in life: One is my birth-right identity and the other is my digital identity, and the 2 shall never meet. *I don't have a Google account, and don't use Chrome or gmail. *I don't have a Facebook or a Tweeter account and don't own a parcel in the 'cloud'. *I don't use any of the "FREE" versions of any product on the market, including AVG (or Avast or Avira, for that matter). *I don't register at the supermarket with my credentials to get discounts, nor do I even have any credit cards or even a Starbucks awards account, for my daily caffeine intake. *I learned a long time ago to use aliasing of my email account at Fastmail.fm which I pay for. *I refuse to watch commercials on TV, won't wear any clothing that has company names/logos and I even promptly remove the license plate frame advertisements when I purchase my next car. It is not the easiest or the cheapest way of leading an American 'consumerism' lifestyle but I do okay: Even if it means that I am forced to abstain from owning a smartphone and not being part of the totally 'connected' netizens. My aim has always been to be a marketeers worst nightmare; if not their Satan. I don't even mind if I am called totally paranoid or even delusional! At least give AVG kudos for the guts to make things simple and clearly defined. If only all others would make their verbiage as transparent! Robert A. Heinlein said it best: "TANSTAAFL"
There ain't no such thing as a free lunch. Everything costs money/time and has to be paid for by someone. As you said, at least AVG is telling its users what is being collected and how the data is being used. I'd HATE to see AVG's simple-plain-English translation of their agreement back-fire in their face. I think it sets a good example for other companies to follow, and you bet that they are ALL watching this 'experiment' in 'Plain-Speak' to see if there are negative repercussions which would push other companies to bury their perhaps even more nefarious intentions in even deeper legalese. I for one say GOOD WORK AVG! - THOUGH, (ah-hem) I don't use it, my ISP provides another real-time scanner for free. Though I have used it in the past without fear or problem - though that may have been naive - trust has to start somewhere. I mean, the NSA is NOT a covert company pulling the strings for AVG - though I've often thought that were the NSA to front an anti-virus program, it would learn FAR more than it does, or can, now. Perhaps the American Anti-virus Company (AVG)may soon be THE freeware of the coming decade. . . . .
How about an antivirus company coming out with an equally direct and plain-English user agreement, that says it will not share your information with anyone, for any reason, unless required by law. to possible invasion of privacy on the internet. I went from AVG to Avast because it seemed to be a better product for me. Now I may return to AVG, to vote in favor of honesty and openness by free software providers. Six of one. Duh. You are right that all the other companies probably doing this also. So much for privacy. However we must try to sort out the bad ones and keep each other informed. I commend AVG for putting their agreement into plain language that non-lawyers can actually understand easily. I think that what they are saying in their agreement is pretty much what you have in the other products agreements, it is just that AVG is being a lot more honest and upfront about it rather than obscuring what it is you are actually agreeing to with Legalese B.S. I have used AVG Pro-Internet Security many years,never been hacked, did have a few problems with it not working ,but had a remote service call in to my PC in no time ,problem fixed. I assume the Pro means I am not included in the data selling, but even if it does sell that generalised info, so what.This privacy issue phobia can go too far,& I think that there is not much about me that is not already recorded everywhere.The "privacy" that people think they are guarding is long gone.Bring on the Australia card with all my info on it,I have nothing to hide,do you? Why must we all complain, that most companies are "out to get us" and then, still complain, when one or a few get honest, with us??? I say, you either like and want a "free" version or you don't -- It's that simple. I do believe, this has been the way of the Internet, since, the beginning. The "I'll scratch your back, if, you will scratch mine?!" Collecting average, minor stuff isn't the real issue -- I simply am concerned, that if, AVG does this for the FREE version -- How do they handle the PAID version??? The exact same way??? It simply, amazes me that these BIG Anti-Viruses companies, would do all of this -- Yet, Bob Rankin will NOT sell any information or even let it "leak" to others. Bottom line, it truly is a matter of honor. Once again, my old adage is proved viable; "There is nothing 'Free' on the internet". Everyone wants to make a buck in whatever way possible!